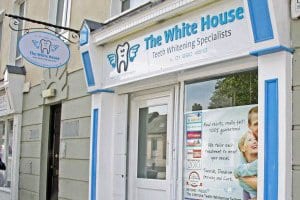 The White House Teeth Whitening clinics are Ireland’s premier teeth whitening specialist. Your smile is our business. We offer a tailor designed smile to remove years of staining and whiten your teeth to a natural white aesthetic. Book today and meet our friendly staff and make your smile great again!. Starting in Dublin our first clinic in Swords opened in 2008. We then moved towards Dundrum, where we opened in 2009 then added clinics country-wide teeth whitening clinics in Galway, Cork, and then opened in Belfast, in 2010. We expanded further into the UK and opened teeth whitening and facial aestectics clinic in Edinburgh city and recently opened in Trafford Manchester. Since our opening we have maintained and improved the standards through consistent staff training and innovation bringing superior quality and value. The White House is the industry standard for laser tooth whitening in Ireland and have recently received the Dental Advisor’s Top whitening system 2018. Our focus is you and your smile. 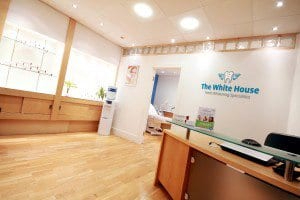 The White House remains the market leader in laser teeth whitening due to a number of factors, our fastidious attention to detail, unprecedented customer service and quality of results. All of our treatments are carried out by our fully qualified dental professionals who have gone through years of university training in the dental field as well as many years of practical industry experience. Performing our tooth whitening procedures in the best interest of the consumer, and to the highest level of safety and professionalism is at the forefront of The White House, teeth whitening specialists company policy. With our full advanced teeth whitening treatment, in just one hour you can expect your teeth to be 5-10 shades whiter. The results can vary from person to person. It has been extensively tested and proven in studies to have zero long long-term negative effects on the dentine, gums or enamel. Our power advanced laser light accelerator is used in conjunction with a whitening gel to produce immediate results. In general, you can expect the results to last from 1-3 years depending on a variety of factors. Factors such as eating staining foods, smoking, and drinking red wine will decrease the sustainability of your results. The brightness can be maintained more effectively by having regular hygiene appointments with your dentist, using a maintenance kit or good quality whitening toothpaste. 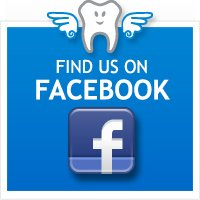 The White House Teeth Whitening clinics are Ireland’s premier teeth whitening specialist. Your smile is our business. We offer a tailor designed smile to remove years of staining and whiten your teeth to a natural aesthetic. Book today and meet our friendly staff and give yourself a reason to smile again. Starting in Dublin our first clinic in Swords opened in 2008. We then moved towards Dundrum, then added clinics country-wide in Galway, Cork, Belfast and Edinburgh city centre and most recently opened our latest teeth whitening in Manchester. Since our opening we have maintained and improved the standards through consistent staff training and innovation bringing superior quality and value. The White House is the industry standard for laser tooth whitening in Ireland and have recently received the Dental Advisor’s Top whitening system 2016. Our focus is you and your smile.